This car was originally built for St. Louis and was numbered 1726. In 1957 they were leased to SF Municipal Railway (MUNI), and later purchased in 1961. In SF it was re-numbered 1159. 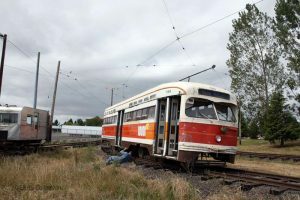 PCC’s were the electric railroad’s answer to the new competition caused by buses and automobiles. They ride very smooth and accelerate quickly. The design was done from 1928-34. They allowed some operations to continue until the 50’s. The PCC’s were so innovative that some patents are still being used today. PCC trucks are still used today on some Heavy Rail transit lines in the US. 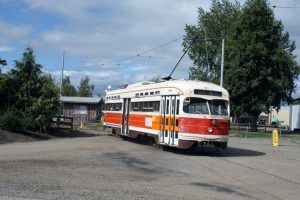 There were at least 5000 PCC cars built in the US, many more in foreign countries. San Francisco retired these cars in the mid-80’s when the new MUNI Metro subway opened. This subway converted 5 streetcar lines to light rail standards. The Subway was no place for a PCC. The subway could only load from “high platforms”. Today SF has put PCC’s back in operation on Market Street on the “F-Market” line. 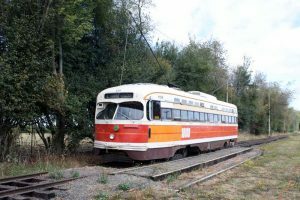 These PCC’s were bought from Philadelphia and refurbished. They are painted in colors of many different former streetcar operators throughout the US.